This Jupiter Rescue review was made after playing the game six times. 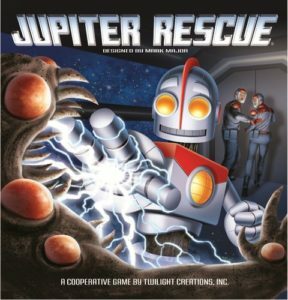 Jupiter Rescue is a cooperative strategy game in which you play as robots on a colony called Jupiter Deep attempting to save human colonists from an alien invasion. Jupiter Rescue was designed by Mark Major and published by Twilight Creations. To begin a game of Jupiter Rescue, you’ll lay out 19 tiles and put colonist figures on all available spots on the middle seven tiles. The team will choose where to place the Evacuation Pod. 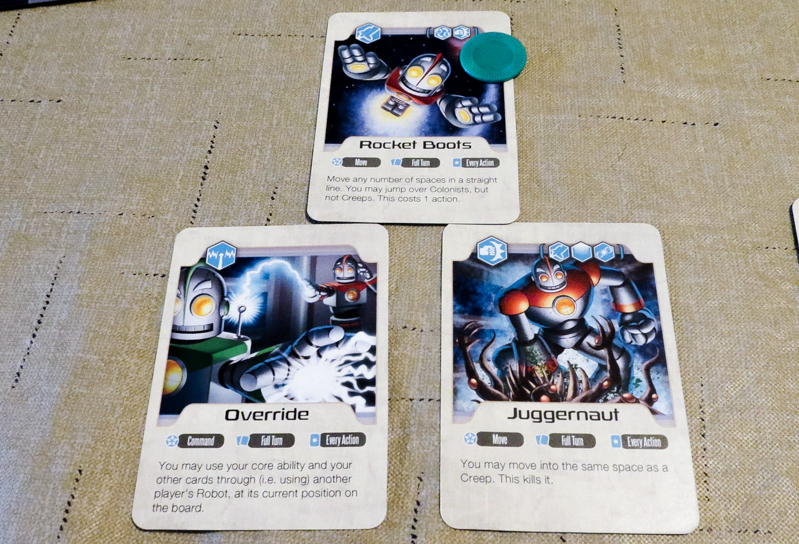 After picking robots to play with, everyone will place their robots in the Evacuation Pod and draw two Rescue Cards. You’ll choose one of those two cards to be your core special ability, which you’ll keep for the entire game (unless a card allows you to switch it). 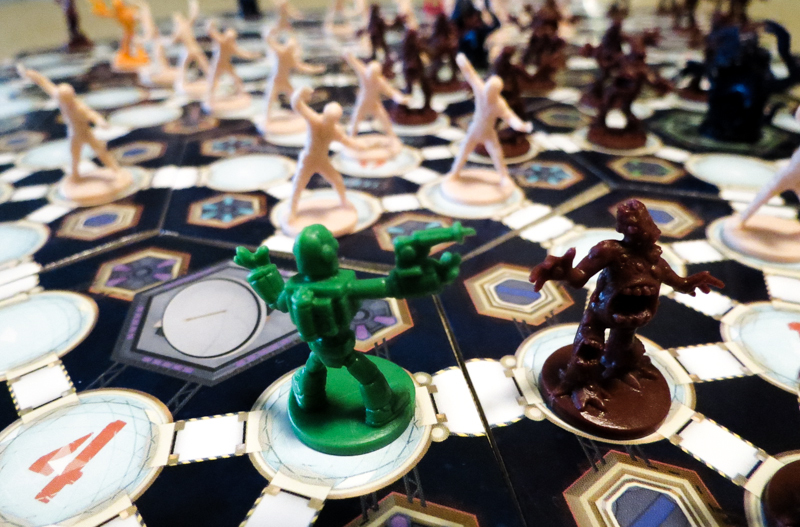 Throughout the game you’re going to be trying to move colonists onto the Evacuation Pod and ship them off to safety. The aliens, called Creeps in this game, will be attempting to move onto the ship and convert those colonists into even more Creeps. You’ll have a chance to take five actions on each turn. Your action options are moving, attacking Creeps, moving colonists toward the Evacuation Pod, and trading cards with other players. You can use any action any number of times. As long as you have a bridge to move on, you can always move to an open adjacent space. The trick is to move to spaces that are out of the way of colonists so you don’t block their path to the Evacuation Pod. Attacking is extremely easy to understand. You can only shoot Creeps that are on your tile unless you have a card that gives you another way to kill them. When you shoot a Creep, it is removed from the board. Moving colonists is also very simple. You can move any colonists that are on your tile or an adjacent tile as long as they have an adjacent space to move to. Once you get a seventh colonist onto the Evacuation Pod, it blasts off and those colonists are saved. By default the player who launches the Evacuation Pod will have to wait until their next turn to connect it to the colony again. When you trade, you can give or take any amount of cards with another player for just one action. You have to use a second action to trade with another player. At any point during your turn you can use one or more of your Rescue Cards, including the card you chose to use as your core ability. These cards can help you move faster, kill Creeps easier, or they can even be combined together. The cards tell you which actions to use them with and how long the effects last. During the Conversion phase, any colonists that are next to Creeps become Creeps themselves. As you lose colonists this way, the level on the Colonist Loss Tracker moves forward, bringing you closer to a loss. If it ever reaches Mission Failed, everyone loses. During the Invasion phase, you’ll roll a die and will place Creeps out on the board based on the result. For a result of 1 through 5, you’ll place Creeps on the outer tiles that have that number. When you roll a 6, you’ll place Creeps on tiles that already have at least Creep on them. If a tile is ever filled with Creeps, it explodes and is removed from the board, making the colony that much smaller. After the Creeps are done doing their damage, then you get to draw two new Rescue Cards. Sometimes you’ll get unlucky and draw a Setbacks card, which can definitely mess up your plans. The Surge card adds a Creep to every tile that gained a Creep that turn. The Power Grab card adds a Super Creep to any tiles that have open Power Plant spots and that don’t have any robots on them. The Signal to Noise card adds Super Creeps to any tiles that have Command Dishes on them and that don’t have any robots on them. For every Super Creep in a Power Plant, the hand limit (normally 4) is reduced by one. If there are any Super Creeps in Command Dishes, everyone loses one action per turn. You can kill Super Creeps the exact same way you kill regular Creeps. You’ll lose the game if you ever reach Mission Failed on the Colonist Loss Tracker. You’ll also lose if all of the Module 3 tiles (the ones with the Power Plants) or all of the Module 4 tiles (the ones with the Command Dishes) are destroyed. You win when you get 28 colonists off of the colony safely and also get all of the robots back to the Evacuation Pod. Probably the coolest thing about Jupiter Rescue is the way you get your core ability. I really like that it is a different Rescue Card every game rather than a set special ability for each character. You can very easily adjust the difficulty level in this game. There are five different options listed at the back of the rulebook, and you can can even mix them up a bit to make a more customized game. A lot of people will love that this game can be played by up to seven players. I’ve played a five-player game and it didn’t drag on too long, so I figure it really could work pretty well with seven. These aren’t incredible miniatures by any means, but they definitely add to the fun factor. I especially like the look of the Super Creeps. The player reference cards are great, making it very easy for people to jump into their first game with very little guidance from the person who read the rulebook. One downside of getting a random core ability every game is that you could end up with one you don’t like. Remember, you only have two cards to choose from at the start of the game, and you might not be too happy with the options you’re given. Quarterbacking can be an issue in Jupiter Rescue. You can keep your cards hidden to try to avoid some of this, but even then an “alpha player” can still try to tell you where you should move to and who you should shoot on your turn. The tiles aren’t ugly by any means, but they are a bit boring looking, in my opinion. I wouldn’t say there’s anything extremely special about Jupiter Rescue, but it is a solid little family co-op that most of the people in my group have enjoyed playing. 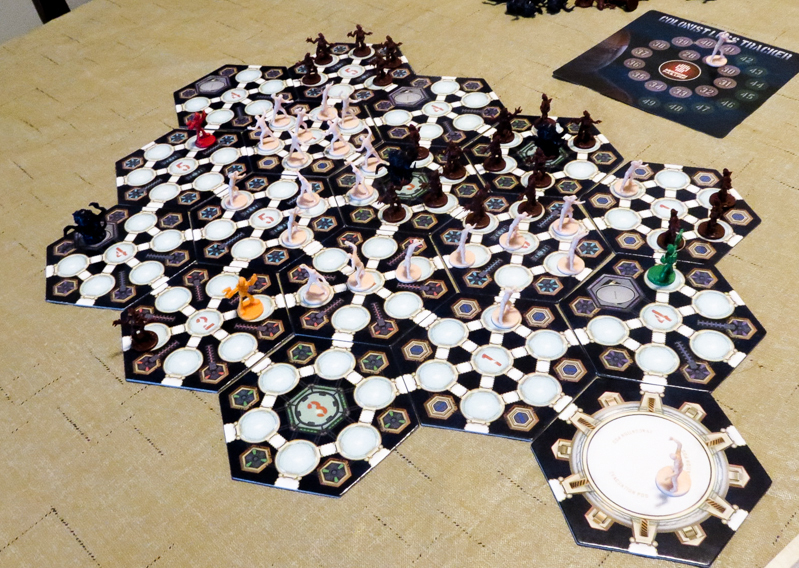 It has a cool theme, a unique look, and it plays differently than any other cooperative board game I’ve played. I’m glad I took a break from all of the newer games to give this one a try. I’m not going to recommend Jupiter Rescue to everyone since there are so many great cooperative games out there to choose from these days. People who should get this one are those who are interested in the theme or just really love co-ops and want to try something a little different. Thanks for taking the time to read our Jupiter Rescue review! To stay updated on all things cooperative board games, follow us on Twitter, Facebook, or via RSS.